After his discard phase, Zhang Zhao can give all his discarded cards to any player. Whenever anyone else competes, Zhang Zhao can use a hand card that is less than eight for any player. The target's number is increased by half the number on Zhang Zhao's card, rounded down. When Zhang Zhao dies, he can force any player to draw three or discard three. In "Win Over" Zhang Zhao must give all his cards to one person. 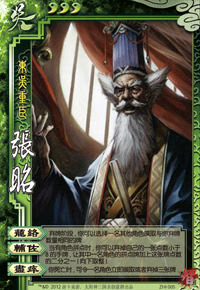 When using "Assist", Zhang Zhao puts his card in at the same time as the other combatants, before anything is revealed.